We, being a leading organization of the industry, come up with a broad and unmatched collection of PH Connector. 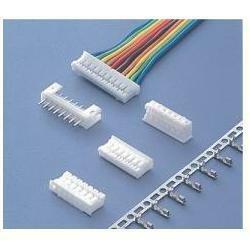 These provided connectors are developed in tune with the industrial standard set by the market leaders using quality components and sophisticated techniques. Moreover, these are available at fair market price for the clients. Maruti Electronics, located at Delhi, is a well-known trader and supplying of a wide range of products including Wiring Harness, Wire to Board Connectors, Board to Board Connectors, Wafer Housing Socket and Connector, Wire to Wire Connectors, D Connectors, FRC Connector, FRC Cables, Box Header Connector, Berg Strips and Flow Solder. The entire range of products is used and demanded across the region and is known for their high strength, efficiency, performance and long life. We believe in keeping pace with market trends to be stay and stand ahead of the competition. Thus, our clients always remain stress free from the quality and specifications concerns of the offered products. By keeping rewarding relationship with large pool of satisfied clients, we are able to understand key requirements and respond them with the ideal products. Besides, our present goodwill in the market indicates our satisfactory and standard performance in the market since its origin.